... doesn't mean it isn't true. 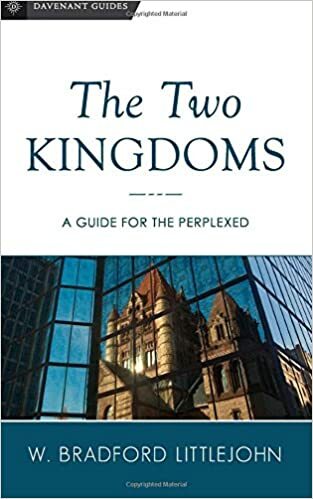 I've not reviewed Brad Littejohn's recently published book, "The Two Kingdoms: A Guide for the Perplexed" but I'm familiar with it and Brad's thesis: that what today passes as "Reformed Two Kingdoms" (R2K) theology bears only a limited resemblance to the historic doctrine. (For a sampling of my comments on R2K go here or here.) The historic or classical Two Kingdoms approach was taught by the magisterial Reformers in the sixteenth century and was part and parcel of confessional Protestantism through the seventeenth century. R2K, by contrast, is largely a late-twentieth-century construct. Several characteristics that set classical Two Kingdoms apart from R2K: while the invisible church is still tied to the spiritual kingdom, the visible or institutional church belongs mostly to the temporal kingdom, along with all other realms of human activity. This move has the effect of “de-sacralizing” church authorities—they are no longer seen as governors of the spiritual kingdom—and expanding the realm of adiaphora or “things indifferent to salvation” in the church. Littlejohn sees this as liberating the church from an oppressive precisianism that demands explicit biblical warrant for every church practice. Yet Dillon's ultimate conclusions surprised me. After acknowledging the cogency of Littlejohn's criticisms of R2K, the fundamental distinction between creation and redemption, the reality of natural law and the redemptive focus of the Bible, Dillon hastens from the classical Two Kingdoms conclusion that the civil state has substantial claims to govern the outward conduct of its citizens. In other words, Dillon likes modern Liberalism. That’s all well and good but it’s not classical Two Kingdoms theology. In other words, Dillon rejects the view of the civil magistrate envisioned by Calvin and the un-bowdlerized Westminster Standards. Dillon may be right: Calvin, the magisterial Reformers, and everyone but for the Anabaptists could have been wrong but he should own up to his own rejection of classical Two Kingdoms theology. Perhaps Dillon lays his Kingdom cards on the table when he urges readers of his review to consult the works of Abraham Kuyper and Klass Schilder. Never mind that Kuyper's followers deposed Schilder from church office while he was hiding from the occupying Germans during WWII, Dillon conflates both men into the neo-Kuyperian "one Kingdom" theology that runs counter to both classical Two Kingdoms and R2K. In any event, I commend Littlejohn's book to the attention of my readers. It's good to see that what evangelical (and especially Reformed) Christians take for granted in terms of Church-State relations today differs markedly from what their tradition originally taught.